Through the images of this exhibition and book by the same title, Dan Budnik presents the vision and peaceful intention of the leaders of the civil rights movement, not by overwhelming us with sights of violence or hatred, but with a view into the lives of the leaders, the marchers, and their communities. “Marching To The Freedom Dream” illustrates three pivotal marches of the Civil Rights Movements: the 1958 Youth March for Integrated Schools, organized by Harry Belafonte; the iconic 1963 ‘I Have a Dream’ March for Jobs and Freedom on Washington, D.C.; and the 1965 Selma to Montgomery March for Voting Rights, where 1000s of people marched 54 miles through segregated Alabama. The relevancy of this civil rights exhibition is evident in remembrance of the fiftieth anniversary of the Selma to Montgomery Voting Rights March, the recent riots in Ferguson and protests in other cities, the January 9 release of the feature film “Selma,” and Martin Luther King, Jr. Day on January 19th. 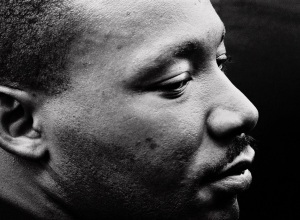 The many acts of violence during this period stressed the peaceful approach to protest and activism led by Martin Luther King, Jr. As segregationists plotted against the movement, and splinter groups led by revolutionary leaders chose a violent direction, it became evermore difficult to stay on a peaceful path. It is a privilege to be present with Dan Budnik when he recounts the events and emotions of these marches and connects a conversation with his images. His book includes hand written annotations describing the actions and activities within these images and you can hear his voice in each of these notes. We must always inspect our own behavior and defend each other’s Civil rights in a constant vigilance against repression and bigotry to prevent the erosion of the freedoms we fought so hard to attain. “We accomplished a lot without violence,” said Budnik. “The kids I photographed in Selma were not loose cannons like the kids in Ferguson. Everyone has forgotten the history.” By reminding us of the selfless sacrifices of our citizens, this exhibition serves to reinforce that we must not take human rights for granted.